I’m not a fan of London’s Mayor Sadiq Khan because I’m not a fan of the contemporary Labour party, but I think I have something to add to the debate about who is to blame for the flammable cladding on Grenfell Tower. I was a chair of a housing association management committee in Scotland and have been involved in tendering processes for similar amounts as have been said to change hands for the Grenfell cladding. Glasgow is a far smaller city than London, but even so the Lord Provost – our equivalent of a mayor – was not involved in the tendering process. No politicians from any party or at any level were involved. And they knew better than to ask to be involved, as even the request would have exposed us, the management committee members, to accusations of being vulnerable to political influence. According to the Evening Standard, a former chair of the firm acting as landlord for Grenfell Tower, the Royal Borough of Kensington and Chelsea Tenant Management Organisation (KCTMO), stepped down because of “concerns” about how the firm was being run, as did residents who were part of the management committee. It is with the commercial arm of this firm that the investigation into the fire must begin, and also the investigation into the tendering process, which must also have the remit to inquire as to whether management committee members had the latitude not to accept the lowest amount tendered. Then the investigation must go to the firm which supplied the cladding, Harley Facades. Did this firm use “green” legislation to bypass safety concerns, or did it flog KCTMO the cheapest stuff it had lying around claiming it would win green brownie points with the council? How many more lives are presently endangered by such green issues? And finally there is the number of dead. Do either Kensington and Chelsea Borough Council or KCTMO know or care how many people were actually living in its property? I ask because the whole nightmare could be a parable of the fate of working-class people in the face of the Establishment, crammed into a concrete box and forgotten. And at the end, the dead have only one right: to be remembered. Chapter 12: Was the 2005 general election rigged? Buy Brexit and Democracy from amazon.co.uk (or your local Amazon store). Buy Brexit and Democracy from Smashwords. Jeremy Corbyn, the Labour Party leader, has been feted as winning a great victory – with The New Statesman, for example, publishing a piece called Jeremy Corbyn won a great victory. His party won 262 seats and Theresa May’s Conservatives won 318. Has the Left lost all grasp of arithmetic? Unfortunately not. What we are seeing is a political arithmetic from a very sinister time in the first half of the twentieth century in Germany: Heidegger’s arithmetic, from his 1927 work Being and Time. Martin Heidegger was, famously, “Hitler’s philosopher”. He rebelled against the phenomenology of his mentor, Edmund Husserl, which allowed each person an equal right in collectively constructing the world; instead Heidegger divided humanity into two: the “authentic” and the “inauthentic”. The authentic are the people who, in Heidegger’s view, matter: the elite, even the Master Race. Their thoughts count for much more than the inauthentic, the rest of humanity in an amorphous herd whom Heidegger calls “the they”, whom Heidegger accuses of the tendency to establish a dictatorship of “inconspicuousness and unascertainability”. It’s not difficult to see how those eager to apply a veneer of intellectual respectability to that franchise of street-fighting gangs called the Nazis saw something they could use in Heidegger’s philosophy and adopted it as their ideology. The classification of the inauthentic as the Other, the they, powered the Holocaust. In 1940-41 Jean-Paul Sartre read Being and Time while a prisoner of war, and would use it as an inspiration for his existential work Being and Nothingness, in which he retains Heidegger’s classification of “the they”, defining it again as the Other, an amorphous mass that “disintegrates” when one tries to understand it. Sartre’s importance is not so much in what he wrote, but in that his work provided a bridge for Heidegger’s influence to travel from the Right to the Left – Jacques Derrida, for example, was dismissive of Sartre as “merely another metaphysician”, but his breakthrough and most influential work, On Grammatology, is full of references to Heidegger. There was a golden age of socialism in Britain. It started in 1948 when Clement Attlee’s government instituted full and equal suffrage with the Representation of the People Act 1948 and founded its corollary, the NHS. And it was ended when the OPEC oil crisis of the mid-1970s swallowed up the money that makes any golden age possible. In the wake of this, the socialists who followed used Heidegger-ridden logic to justify their rejection of democracy as a means to pursue the socialist agenda, a justification that was, in their eyes, intensified when the OPEC-fuelled crisis reached full penetration and swept Margaret Thatcher to power in 1979 after the “winter of discontent”. That’s when Heidegger’s arithmetic became as fully accepted by the hard Left as it had been by the Nazis – not that surprising when you consider politics is a circle, so that as left and right descend below the horizon of democracy they continue to become more distant from the open society, but get closer to each other: see the diagram on the book cover below. So we had Militant running Liverpool City Council in the 1980s, justifying the misery it caused to its own working-class employees by the glories of the Revolution to come: Heidegger’s arithmetic in action. Heidegger’s arithmetic is also apparent in the attitude of former Home Secretary Diane Abbott sending her son to private school while opposing increasing grammar-school places for working-class children: the offspring of “the they”, the inauthentic, must be denied any opportunity to be able to compete with the children of the elite, the authentic, so as to deny them an intellectual foundation from which they might set out to frustrate the goals of the elite. These goals have never, at any time, had anything to do with enabling the many - the working-class, "the they", to better their lot. And Heidegger’s arithmetic shines through in Jeremy Corbyn’s composure as a general who has won a great victory: his hard-Left MPs are the elite, and any MPs opposing them, even if they are numerically superior, are inauthentic and therefore their numbers count as nothing. Nothing is so toxic to Heidegger’s arithmetic as full and equal suffrage democracy, which is why Corbyn has radicalised a horde of young idealists to oppose democracy by calling for restricting the franchise to those under 60. If they succeed in this it is the beginning of the end for democracy: the next step will be epistocracy, where people have to pass exams before they are deemed able to vote by a state who would only pass those who would vote according to its wishes. At present, the only qualification you need to vote is the capacity to suffer because of the deeds or misdeeds of your government, and this must remain so if you wish to be safe from your government. If this radicalised cadre manages to decentre full and equal suffrage as a means of deciding who rules, we can only make our opposition to our rulers known by unrest, which runs the risk of sliding into civil war. And that’s why Heidegger’s arithmetic needs to be put into history’s waste disposal unit. Buy Brexit and Democracy from amazon.co.uk (or your local Amazon store)! Buy Brexit and Democracy from Smashwords! 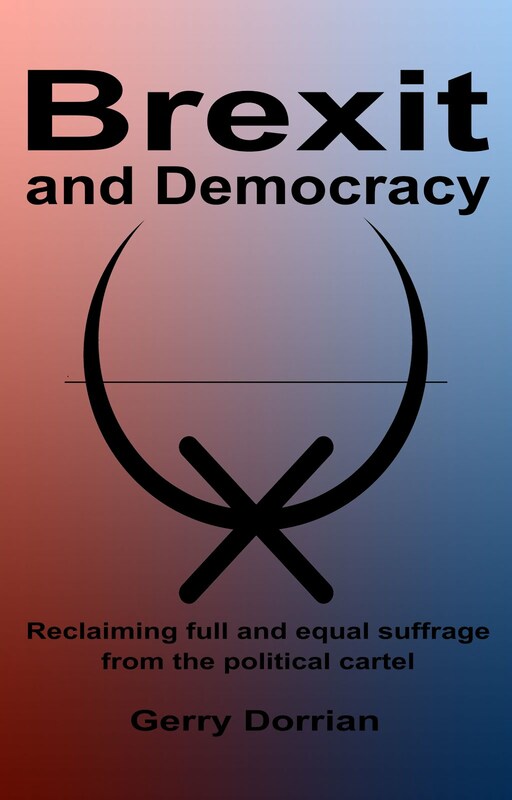 Brexit and Democracy: Reclaiming full and equal suffrage from the political cartel is now on Smashwords. A detailed survey of Brexit and the historical, philosophical and political issues surrounding it, this is your unmissable Brexit companion! Why did it take the Scottish National Party to start an "avalanche of philosophy" in Britain that finally saw the long-promised EU membership referendum materialise? What was the 2012 incident that enabled UKIP to put a crack in the political cartel? Why was nothing done when Otto Kirchheimer started noticing cartelisation in European political parties in the mid-1950s? Did the Marshall Plan unwittingly lay the groundwork for the eventual formation of the European Union? What is the relationship between the German and Italian unification processes and the EU? Did nation states start to evolve from the 1648 Peace of Westphalia, or from the 1555 Peace of Augsberg? The European Union may have been officially founded by the Maastricht Treaty in 1991, but the idea has been around for a very long time. In fact, the phrase "The European Union" was first used by Charles Irenée Castel, a former soldier who became a priest and was known as l'Abbé de Saint-Pierre (and gets a mention in Tolstoy's War and Peace). 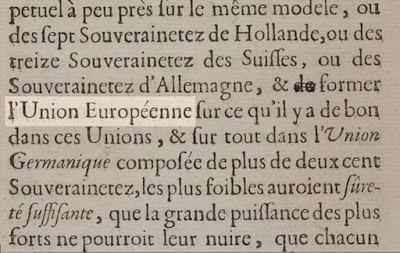 The European Union, according to Saint-Pierre, would be modelled on the cooperation between the German principalities, which were then effectively, if not formally, as related as England, Wales and Scotland are now. That is to say, in our idiom, it would be a supranational superstate. Saint-Pierre said heads of state would have their authority over their citizens guaranteed, but, right afterwards and in contradiction, he proposed that the Diet (a proto-Brussels) would be the "supreme judge" of its members' rights and that any member breaking a treaty would be treated as a "public enemy". Read more in Brexit and Democracy: Reclaiming full and equal suffrage from the political cartel - out now for Kindle! Bibliography from "Brexit and Democracy"
Go to Amazon to buy your copy now! Sytko, Glenn A, German POWs in North America, 2016. Was the 2005 general election rigged - and if so, why? Was Britain's entry to the Iraq war linked to the above? How did 56 Scottish National Party MPs arriving in Westminster in 2015 make the EU referendum possible? Why did the Liberal Democrats switch from opposing a referendum to demanding one? Why was a plan for European monetary union abandoned in the early 1970s? And what on earth does the cover illustration signify? 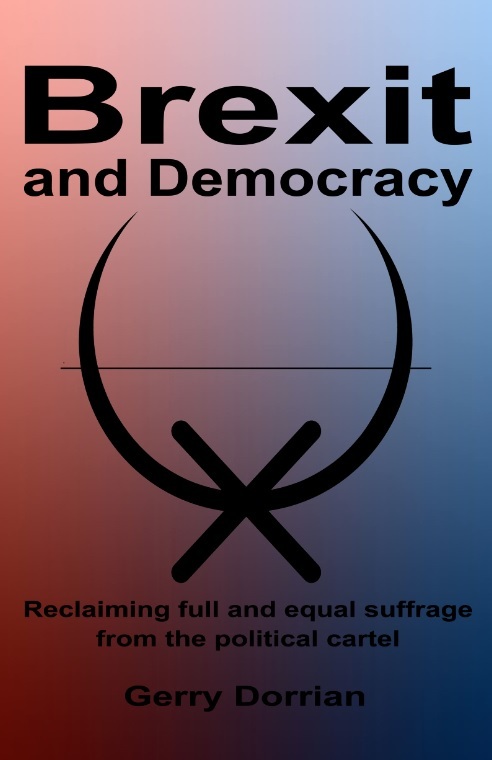 "Brexit and Democracy: Reclaiming full and equal suffrage from the political cartel"
Quotes opening "Brexit and Democracy"
"Brexit and Democracy" is coming! Bertha Mukodzani's blog ~ unleash your full potential! So my children asked: 'Was there Halloween in the Middle Ages'? Examine men’s ruling principles, even those of the wise, what kind of things they avoid, and what kind they pursue.